Contrary to many employment models, we take an interest in the whole student employee, not just their role in our organization. We monitor the academic performance of our student employees and enjoy recognizing strong academic performances. We also seek to support and refer students to helpful resources for academic or other challenges. We care about our employees, and we ask our employees to care about our patrons. Look below for Campus recreation student-employee job descriptions, to see how you may fit into the Campus Recreation Team. Click here to download the general Campus Recreation application. Click here to download the Group Fitness Instructor application. Click here to download the Personal Trainer application. Click here to view the Intramural Sports Official Interest application. Completed applications can be dropped off in person at the Student Fitness Center Reception Desk or emailed to siuecrec@siue.edu. All applications are kept on file for at least one full semester for Campus Recreation Area Managers to review whenever they may need to hire additional student staff. The supervisor will arrange working hours. Students should give a copy of their class schedule to their supervisor as soon after they register as possible for use in scheduling hours. Students work an average 10 - 20 hours per week. This is a temporary student work position. The position is subject to renewal at the beginning of each semester. The Student Fitness Center is open on some designated official university holidays. Students are expected to work during holidays and break weeks. In case of inclement weather when classes are canceled, you are expected to report to work. Students may not work more than 28 hours per week. If you work at more than one location on campus, the total hours cannot exceed 28 hours. Job Description: Teach group exercise classes to the University community. Assist with the maintenance of exercise equipment (i.e. body bars, stability balls, rubber tubing, hand weights, etc. Assist in the planning and implementation of group exercise special events. Offer useful, tactful, and safe advice to individuals regarding their exercise program and/or use of equipment. Inform facility users of various Campus Recreation sponsored programs. Enforce all facility and program policies. Ability to conduct safe and effective exercise classes. Experience teaching aerobics to various groups. An understanding of strength training and cardiovascular exercise. Ability to assist individuals in developing a safe and effective exercise program. Certification from a national organization is desirable. Job Description: Provides support to staff with technical issues including printers, programs, and setting up projectors. Also, responsibilities include making sure the Campus Recreation website is updated and looking its best. Job Description: Graphic Design position creates flyers, posters, digital signage, and more to support Campus Recreation. Graphic Design/Art majors preferred but not necessary. Proficient with Adobe InDesign and up to date with current marketing and design trends and information. Job Description: Provide customer service to patrons purchasing memberships, trips, and other services provided by Campus Recreation. Individuals holding valid CPR and First Aid certifications are strongly urged to apply and are highly regarded when employment selection is made. Job Description: Support the needs of our patrons with pro-shop sales, no cost or low fee sports equipment rentals, court reservation, locker rental and other support services. Job Description: Monitor and supervise the pool facilities, enforcing policies and procedures. Monitor and enforce pool rules and policies. Keep facility clean and organized. Know facility's emergency action plan, and how to engage it. Perform life-saving duties when needed. Answer patrons questions and follow up on requests. Assist with the opening and closing the facility as needed. Attend all scheduled meetings and in-services. Maintain a good level of physical fitness. Work with swim lessons and private parties. Currently certified as a lifeguard with a Nationally Recognized association and currently CPR & First Aid certified. Must be able to pass a swim test and have a good level of physical fitness. Must possess good oral and written communication skills, as well as quality people skills. Qualified candidates will be required to work early morning to late evening shifts. Job Description: Help all patrons feel welcome during their visit to the Student Fitness Center by providing a welcoming smile and greeting, providing guidance on general use of equipment, remaining available for questions and not being afraid to approach a patron that looks like they could have a question. Supervise the Cardio and Weight Rooms located in the Student Fitness Center for safety and policy compliance. Welcome, greet and provide assistance to facility users. Provide safe and effective instruction on general use of all cardiovascular and weight training equipment. Conduct facility tours and equipment orientations. Maintain and clean exercise equipment. Keep fitness spaces organized and clear of obstructions. Familiarity with strength training and cardiovascular exercise/equipment preferred. Job Description: Complete Fitness Assessments and/or Fitness Consultations for students and members using MicroFit(R) software. Utilize MicroFit(R) software to complete fitness assessments including height, weight, blood pressure, body composition, cardiovascular endurance, muscular strength, muscular endurance, and flexibility. Respond to indicators that would require stopping a test, such as recognizing high blood pressure. Converse with and answer client questions throughout the test. Confidently talk client through MicroFit(R) results print out, answer any questions from client. During Fitness Consultations, confidently discuss basic principles for clients including items like creation of a SMART goal, recommendations for physical activity and helping client create a basic plan (not designed to create a specific workout). Strong social skills to converse with clients throughout the assessment, helping them feel comfortable and confident in completing. Knowledge of ACSM standards and ability to discuss and answer client questions. Completion of Assessment and Prescription academic class preferred. Job Description: Develop personalized exercise programs for individuals and assist them during workouts. Develop safe and effective exercise programs for individuals of various fitness levels. Conduct and assess health and fitness screenings. Provide safe and effective instruction of all cardiovascular and weight training equipment. Work a minimum of one Campus Rec special event or program per semester. Experience in developing comprehensive exercise prescriptions. Thorough understanding of strength training and cardiovascular exercise. Ability to modify exercise programs for special populations. Job Description: Provide guidance to and ensure the safety of all climbing gym participants. Teach users primary safety and provide an orientation to the space. Assist individuals with climbing equipment. Assist with hosting group climbing events. Offer users advice on how to improve their climbing skills and techniques. Maintain climbing equipment and wall. Conduct daily inventory of climbing equipment. Knowledge of basic and advanced climbing techniques. Job Description: The purpose of the supervisor position is to supervise intramural team sports including flag football, volleyball, indoor soccer, outdoor soccer, basketball, softball, and other activities. Supervisors are also responsible for overseeing and managing a safe and pleasant atmosphere for intramural participants and for assisting the professional staff when needed. Attendance at mandatory supervisors, officials, and captains meetings is also required. Work under the supervision of the Graduate Assistant of Intramural Sports along with the Assistant Director of Recreation Programs. Student supervising is a semester employment opportunity. Bring first aid kit and a walkie-talkie to the event. Aid participants with injuries by providing First Aid and CPR, and report all injuries or problems to the Intramural G.A. 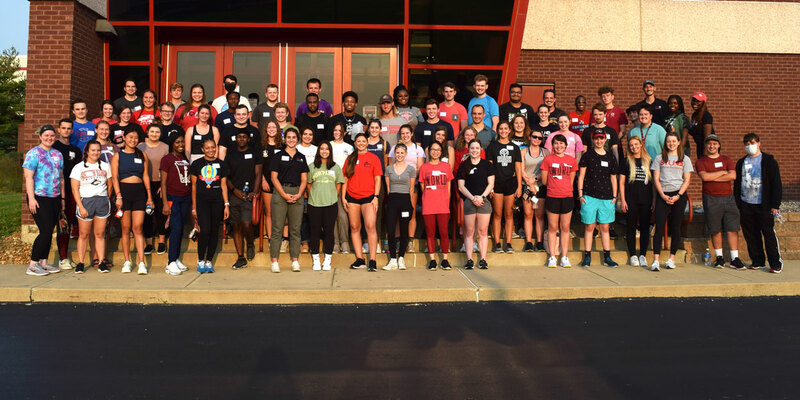 Job Description: The job of Student Facility Supervisor is to manage, oversee, and monitor all areas of the Student Fitness Center and Campus Recreation operation. Oversee safety, customer service and procedure adherence for all programs in facility while providing guidance, leadership and evaluation feedback for 150 student staff in indoor/outdoor aquatics, fitness, member services, equipment issue, intramurals, climbing, technical, marketing and custodial areas including opening/closing responsibilities. Display and maintain a positive approach in your interactions, duties and management of others. Lead guest liaison for any rentals or reservations that may be scheduled in Campus Recreation facility areas. Complete or delegate assignments for these groups as needed. Initiate communication and interact with other agencies as needed, such as SIUE Police, tradesmen, engineers or any other department. Supervise task completion requirements in each area of staffing, cleaning, laundry, etc. Must have a workable knowledge of recreation/ sports equipment. Job Description: Officiate Intramural Team Sports including Flag Football, Basketball, Softball, Floor Hockey, Soccer, Volleyball, and other Seasonal Team Sports. Work under the supervision of the Student Supervisor of Intramural Sports along with Graduate Assistant of Intramural Sports. Attendance is required for the mandatory training and evaluation sessions. Students sports officiating is a seasonal employment opportunity with scheduling based on weekly performance evaluations. Sign-in and collect student IDs of Intramural Teams. View and follow the Intramural Sports contest and enforce the rules judiciously as possible. Oversee the Intramural Sports contest and ensure participation takes place in a safe manner. Assist in closing down the activity are and collecting equipment at the conclusion of the beginning and/or weekend activities. Participation and Sports Officiating experience is preferred. Thorough knowledge of the SIUE Intramurals Sports Handbook. Job Description: Equipment Preventative Maintenance is an important component to help keep our fitness equipment fully functioning and our satellite facilities clean and presentable. A student working in equipment preventative maintenance works under the supervision of the Fitness Coordinator and Fitness Graduate Assistant. Provide assistance in diagnosing or fixing fitness floor equipment. Fix small concerns such as loose screws or cables on equipment. Recognize larger equipment concerns that may require the work of a certified technician. Perform preventative maintenance on fitness equipment in the Student Fitness Center. With guidance from the Fitness Coordinator follow weekly items checklist to help prolong the life and keep equipment working. Assist in cleaning barbells in the weight room. Travel to satellite fitness facilities to clean and test equipment on a weekly (during the semester) or bi-weekly (during the summer) basis. The Student Fitness Center has 5 satellite facilities at Evergreen Hall, Prairie Hall, Woodland Hall, the Student Success Center, and the School of Dental Medicine in Alton. Drive University vehicle to each facility to clean equipment and test for proper functioning. Comfort with basic tools including, but not limited to Allen wrenches, screwdrivers, wrenches, and ratchets. This position has the flexibility to set own daytime hours with approval from the Fitness Coordinator. MUST have strong organization and ability to set and follow a schedule. Experience and comfort in taking things apart and reassembling are preferred!